Emergency crisis management for people with mental health, developmental disability and substance abuse issues is available here 24 hours a day, seven days a week, 365 days a year from Integrated Family Services (IFS), a provider contracted by Trillium Health Services, interested stakeholders were told Monday at an informational session at Southeastern Community College. Representatives of the Columbus County Schools, Columbus County Health Dept., Family Promise of the Lower Cape Fear and various faith-based communities were told that, while IFS has goals of a one-hour response time for telephone calls for help and a two-hour response time for calls for face-to-face help, actual response times usually are faster. Telephone triage usually is available immediately and in-person help is usually provided within 30-45 minutes. resources available in Columbus County during an informational session. The overall goal is to divert people in crisis from ending up in either the hospital emergency room or jail and IFS said it enjoys a good success rate in meeting that goal. There is never a charge to the client if insurance to cover the services is either inadequate or unavailable. 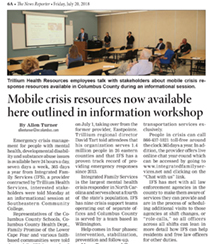 Trillium began providing mental health, developmental disability and substance abuse services in Columbus County on July 1, taking over from the former provider, Eastpointe. Trillium regional director David Tart told attendees that his organization serves 1.4 million people in 26 eastern counties and that IFS has a proven track record of providing emergency responses since 2013. Integrated Family Services is the largest mental health crisis responder in North Carolina and serves about a fourth of the state’s population. IFS has nine crisis support teams operating out of separate offices and Columbus County is served by a team based in Wilmington. Help comes in four phases: intervention, stabilization, prevention and follow-up. Mona Townes and Tracy Hyde of IFS said that one of the primary benefits of their crisis response teams is that everyone can be assured that clients need not be alone in times of crisis. Emergency crisis response services can be provided to suicidal or depressed persons, people with with homicidal ideations, those involved in domestic violence situations or family and marital conflicts, people who are delusional or having psychotic episodes. Assistance in accessing links to mental health and detoxification services as well as death notification and support services are offered. Services cannot be provided for treatment without the consent of the person being treated (or their legal guardian) or for transportation services exclusively. People in crisis can call 866-437-1821 toll-free around the clock 365 days a year. In addition, the provider offers live online chat year-round which can be accessed by going to www.integratedfamilyservices.net and clicking on the “Chat with us” link. IFS has met with all law enforcement agencies in the county to make them aware of services they can provide and are in the process of scheduling additional visits to those agencies at shift changes, or “role-calls,” so all officers across all shifts can lean in more detail how IFS can help residents and free law officers for other duties.